When spontaneity drives the process.. In my previous blog, I examined the process of creating art by planning, using reference photos and, sometimes recurring images. Joseph Young and I like to plan, but once on the canvas, we work in a different manner. But what about the intuitive painters? The ones who pick up a brush and get going? How does that work? 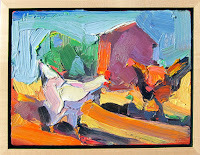 Here are two Wilde Meyer artists who enjoy spontaneity when painting. 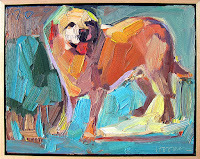 Greg Dye was a professional illustrator for many years, so he had to plan and produce specific images for his clients. 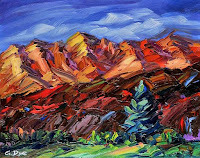 When he took up oil painting several years ago, he did a complete reversal of his process, focusing on loose brush strokes and a more physical style. He told me that he wants to convey his emotion and his passion for the landscape, animals and people of the West. This artist is very generous with his paint. 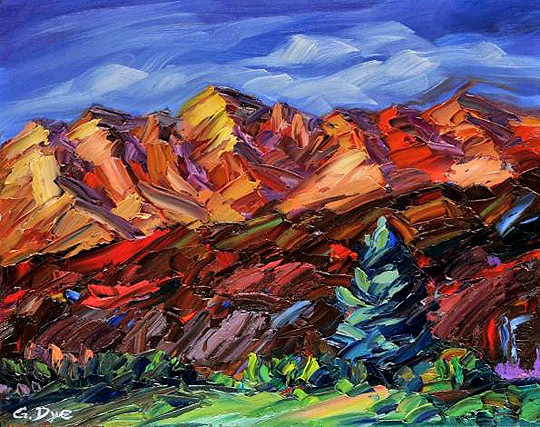 You can see his vigorous brush strokes and thick paint application in his painting entitled “Morning Mountain Range.” Here, the mountains have a three-dimensional effect. I think that Greg shows his light source very well, and he skillfully conveys the distance between the grass and tree in the foreground, the mountains behind, and the sky still farther away. That shows a good understanding of color and values. 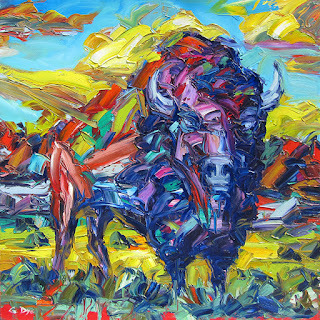 In his large painting called “Fearless,” it seems like Greg has abandoned himself to his process, and let loose. 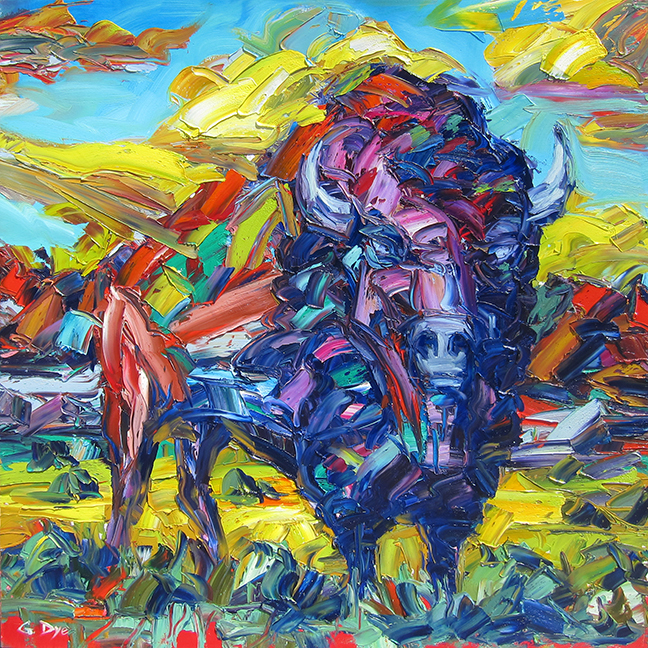 I can picture him painting frenetically, working fast until the image of the fierce buffalo emerges on the canvas. It’s pretty intense! See more paintings by Greg at Wilde Meyer Gallery. I spoke with another Wilde Meyer artist who said she’s “in the intuitive camp.” Dana Hooper tries to “get away from the literal” by employing several different techniques. One way to loosen up, she suggests, is to turn your painting upside down. 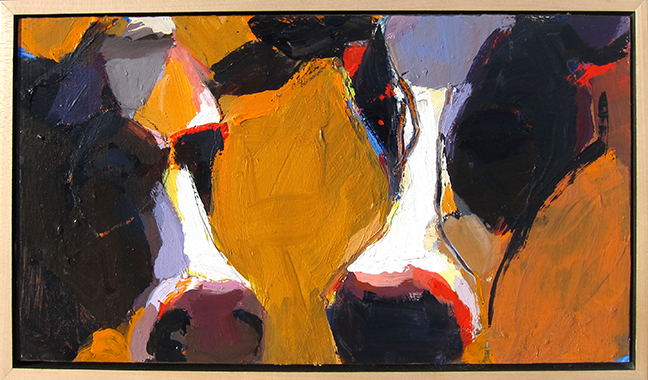 “That can tell you if the composition works, and see the basic shapes,” she explained. Dana, who lives in Colorado, has a background in biology and physiology. 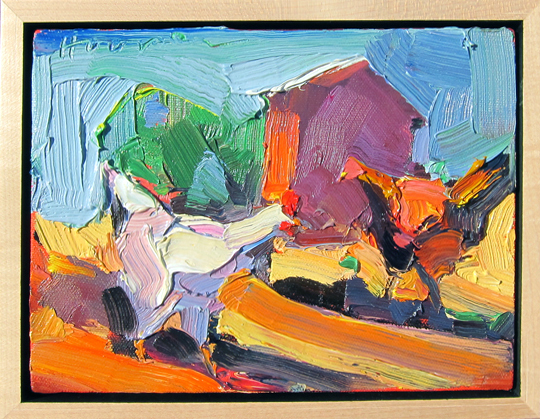 She has lived on a ranch, and is familiar with the animals she paints. Her intention is to paint her subjects simply, with an emphasis on color compatibility and strong brushstrokes. 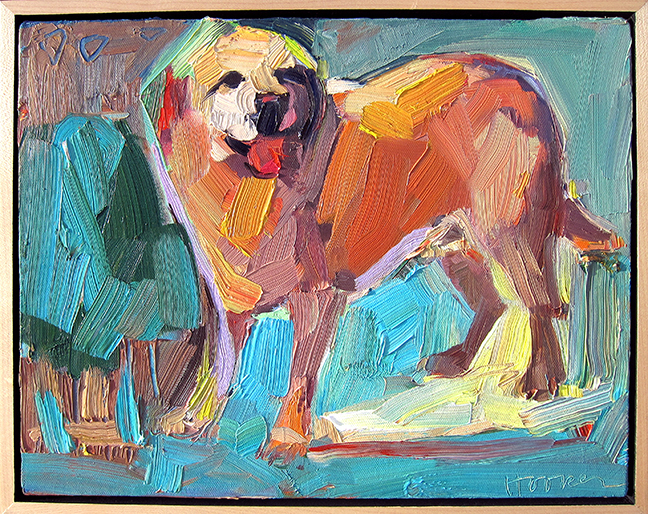 You can appreciate Dana’s loose painting style in her work entitled “Golden.” She’s chosen some beautiful, warm colors for the dog’s body, which really pop against the cooler green/blue background. And, it all looks so fresh because of her bold brushstrokes. She doesn’t blend her colors too much; they just live amicably, side by side. 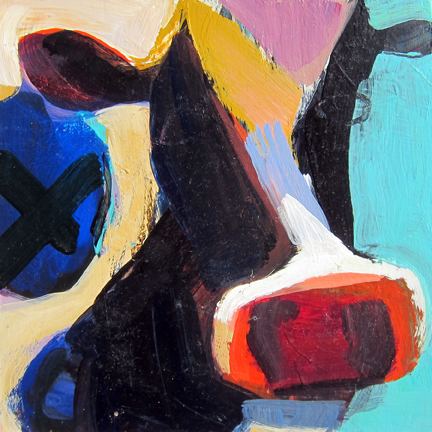 Her painting called “Gung Ho” shows the basic shapes of the cow’s heads with blocks of color, in such interesting hues! I really like the contrast of the gold ochre background with the French ultramarine blue and violet shapes, as well as the bursts of red in selected spots. You can see more art by Dana here. After speaking with Greg and Dana, I realize that applying paint generously is an important part of their technique. That process enables them to paint fluidly, and their brushstrokes are just as important to them as the composition and color choices. I really enjoying speaking with these wonderful artists. It’s so fascinating that we all have such different approaches and styles. It’s our visual language!